Cambuur Stadion is a football stadium located in the city of Leeuwarden which is the capital city of the Friesland province. 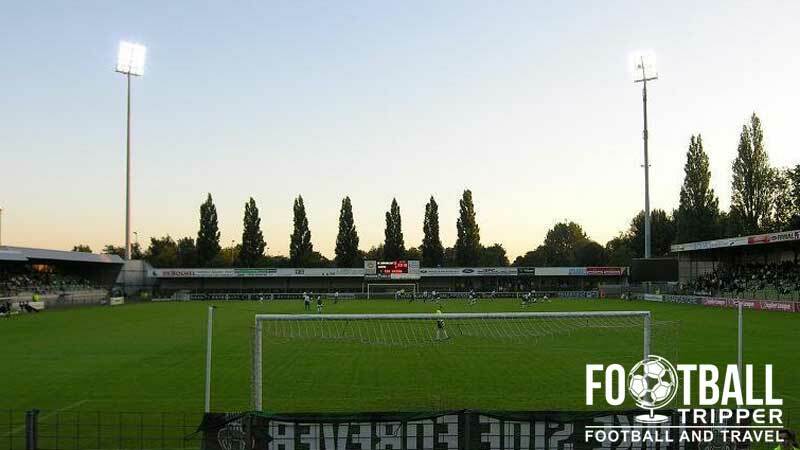 First opened in 1936, the 10,500 capacity ground is home to local side SC Cambuur although they are currently exploring sites for a new stadium towards the west of the city. Cambuur Stadium first opened back in 1936 when it was known as the “Municipal Sports Park”, comprising of a single grandstand and limited match day facilities. 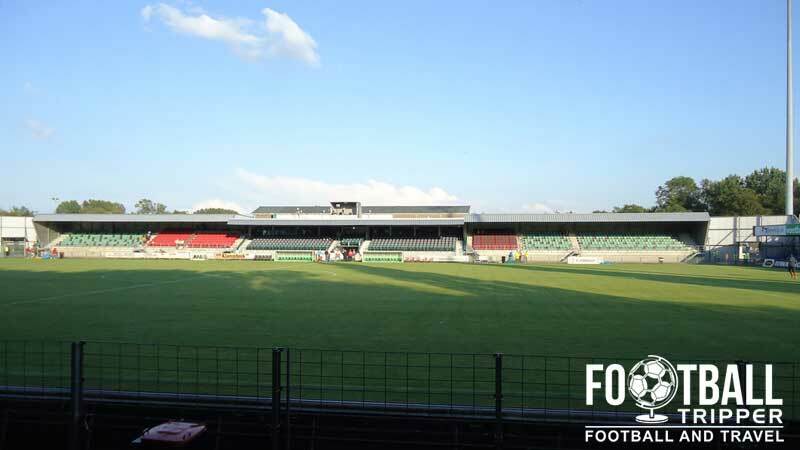 13 years later three further stands were added to anticipate the public’s burgeoning interest in football, resulting in a capacity of 14,000 and in 1961 floodlights were added with the inaugural night time match held against PSV. During the 1980s the first major renovation of Cambuur Stadion occurred with the south and east stands demolished and rebuilt as covered stands. In 1995 the remaining two stands were also rebuilt with the West Grandstand, regarded as the main stand, which runs the length of the pitch now capable of offering a wider range of match day hospitality features. With no further reconfigurations to the stands or physical structures made since the 1990s, the period after the millennium saw the onset of minor cosmetic changes such as the colour of seats changed to blue and red to better represent the supporters. 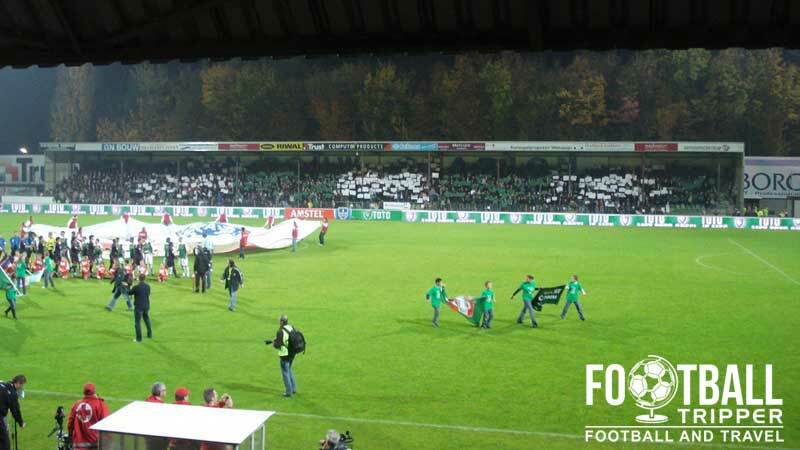 The change of the playing surface from natural turf to artificial grass in 2005 was one of the more noteworthy events at Cambuur but by 2008 the groundsmen opted to return to a natural playing surface. In 2009 Cambuur Leeuwarden publicly announced plans to move to a new stadium located to the west of the city in a project estimated to cost around €35 million euros. Four years later the club were ready to finalise the details of the ground and it appears as if the ground will be located behind the WTC Expo building and have a 15,000 capacity. Cambuur Stadium is comprised of four stands: North, East, South and West. 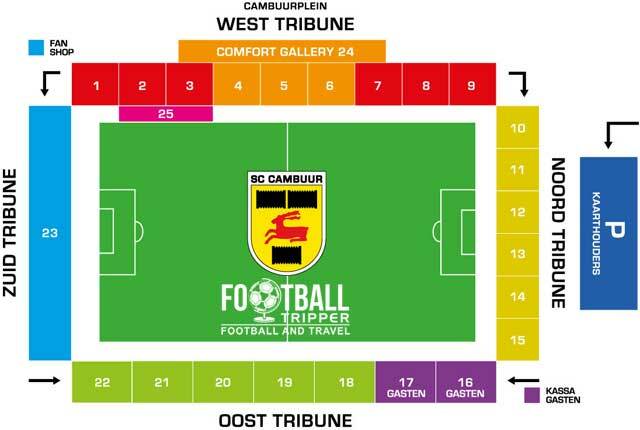 Away fans are housed within the north-east corner of the Cambuur Stadion within sections 17 and 18 of the Oost Tribune as highlighted by the colour purple in the seating plan above. Despite the stand being quite old there are unrestricted views, and if anything the low hanging roof only serves to amplify the noise on matchdays. SC Cambuur operate an online store in addition to a club shop at the stadium. Combined, it is really easy to browse official merchandise ahead of matchdays. One of the small outlets fans can purchase official merchandise from on matchdays. It doesn’t appear as if tours of Cambuur Stadion are currently available. If this ever changes we’ll be sure to update this section. 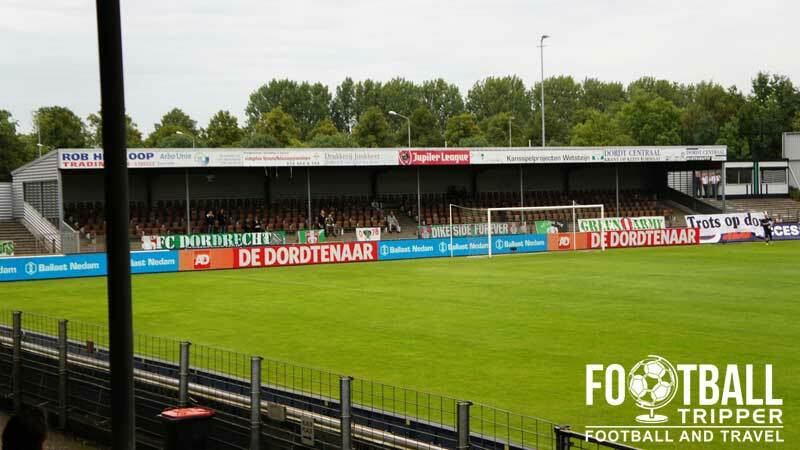 Tickets to see Cambuur play at home can be purchased online from the official website and then either collected in person before kick-off or sent to your home address. Please note that for the big matches against the likes of Ajax, PSV and Feyenoord plus a few other teams prices usually increase by €5.00 to offset the demand. Cambuur Stadion sits 1.4 km north east of Leeuwarden city centre which means that it is accessible within 20 minutes by foot. Indeed, most fans either drive or walk to the stadium on matchdays. The main entrance to Cambuur Stadion. Off limits to most matchday punters, mind. There is limited parking at the stadium’s main carpark on matchdays which is shared with the adjacent Lidl Supermarket. Unfortunately the official website of the club doesn’t offer matchday instructions so be prepared to park in the city centre and walk! Leeuwarden railway station sits on three railway lines with direct services to Arnhem, Stavoren and trains either way to Harlingen–Nieuweschans. Located centrally within the city centre, you can walk to Cambuur Stadion within 20 minutes upon leaving the station. The nearest airport to Leeuwarden is Groningen Eelde which is 74 km away, however the larger Amsterdam Schiphol airport 146 km away is likely to be served by more international flight carriers. The compact city centre which is encircled by a series of canals has plenty of accommodation options including the Fletcher Hotel-Paleis Stadhouderlijk Hof, Hotel ‘t Anker and Grand Hotel Post-Plaza. If you want something right outside the train station then try the Hampshire Hotel – Oranje Leeuwarden which is literally a stones throw away.